Let’s face it: board games aren’t for everyone. There are those who play board games and those who roll their eyes at it. That’s the easy part. Within the realm of those who play board games, there are also those who are willing to play time-consuming strategy games and those who simply want to roll the dice. When it comes to adult-only parties, my wife and I like to err on the side of easy so we can cater to as many people as possible. It’s a good way to test your party friends to see if they can play one of those geeky brain-intensive types later on. When it comes to parties with both adults and kids, the game has to be simpler and still fun for both crowds. Here are a few games that work wonders for just that type of situation. The Pieface Game is hilarious. There’s nothing my kids love more than seeing whipped cream get smeared all over Dad’s face. You’ve probably all heard of Pieface at this point, but it’s still deserving of a place here. 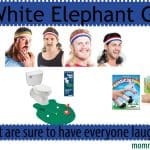 This is the type of game you can play with anyone in a small or large group. The rules of the game are simple. Place some whipped cream on the end of the pie-throwing arm. On the edge of the pie-throwing arm is a handle which players twist as many times as the number they spin. Players gain a point for each time the handle is twisted. The suspense is hysterical as you never know when the arm will flick some whipped cream in your face. In our family, we like to involve those who typically don’t participate in a game like this. As you can imagine, Grandma’s face is priceless when she gets hit with the whipped cream! 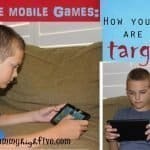 Our kids love it and ask us to play all the time! Bounce-Off board game is easy-to-learn and fun. Set it up, compete for points, and let the balls fly! 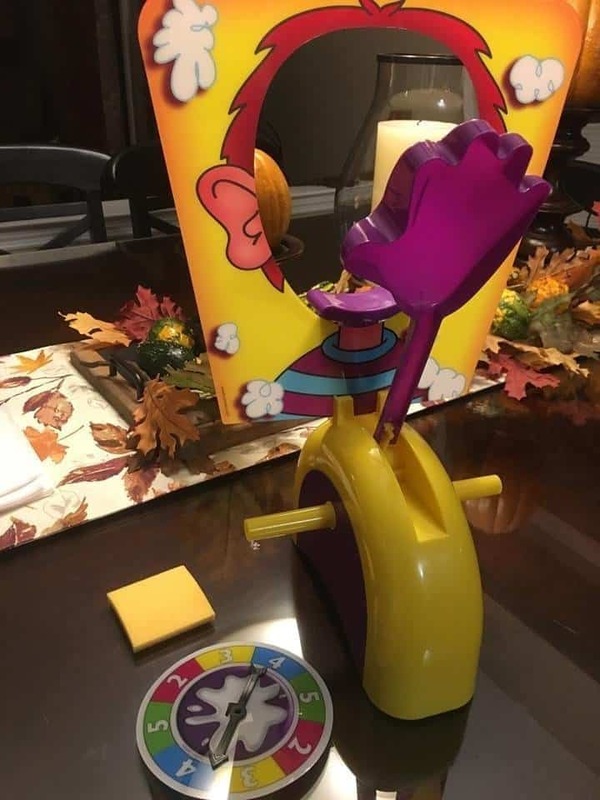 We recently bought this game for my son’s birthday party and after playing it with him and his friends, we realized how simple and fun it could be. The rules are simple. Draw a card with a shape on it and then use the balls to create that shape. The first team to make that shape by bouncing the balls into the board wins. This is a fun game for two to four players that could even be stretched to up to six. You can also play it in a round robin tournament style with various house rules that, in my opinion, make it even more fun for parties. Simply put your guests in groups of two and have them face off. 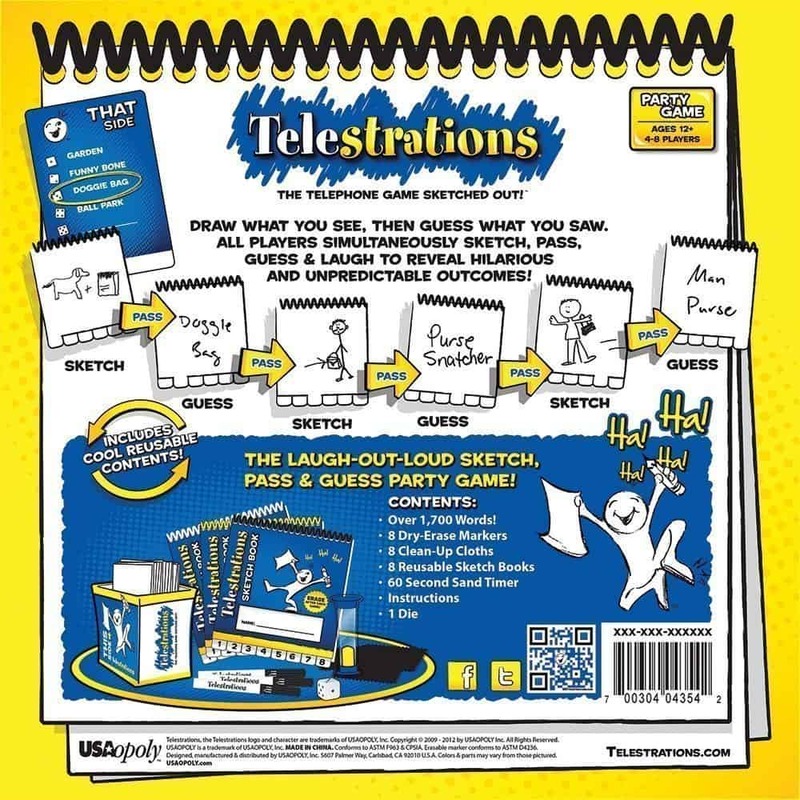 We’ve played Telestrations in adults groups, adult and kid groups, and even just kid groups. It’s always a blast at parties. Telestrations is great for just about any group of people you come across. If you’re playing with kids it’s fun to see the wacky zany things they draw or think up, and if you’re playing with adults you’ll get to know who the artists and the “un-artists” of the group are. To play the game, you grab a card, roll the dice, and then based on the number, you are assigned something to draw. For 60 seconds you draw to the best of your ability and then pass the drawing pad to the left. That person has to put into words what you drew and then pass the pad on to the next person, who tries to draw what the previous person wrote. If you’re like our guests, by the time it gets back to you, your drawing will turn from a house into a castle complete with moat, surrounding trees, and knights. No matter what the outcome, you’ll have a lot of fun with this game. Warning! Not for the timid of heart. 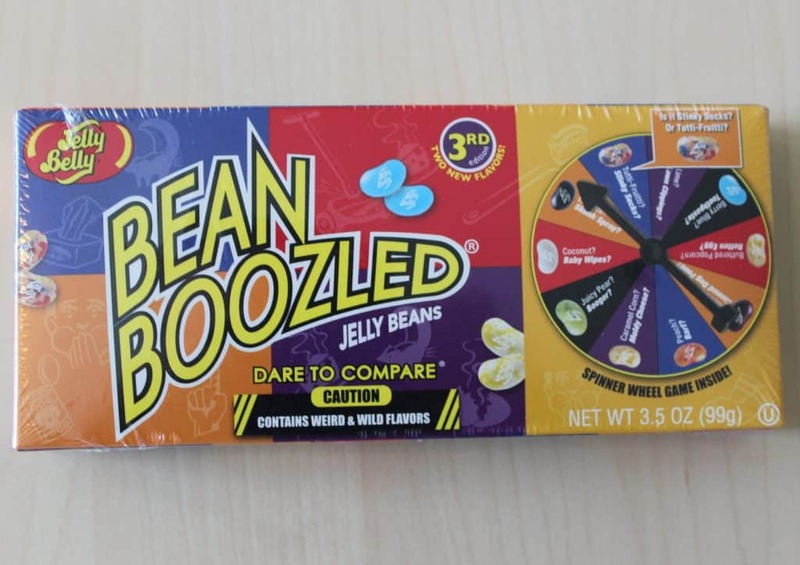 Play this with a group of adults or kids and it’s tons of fun and perfect for all types of parties. 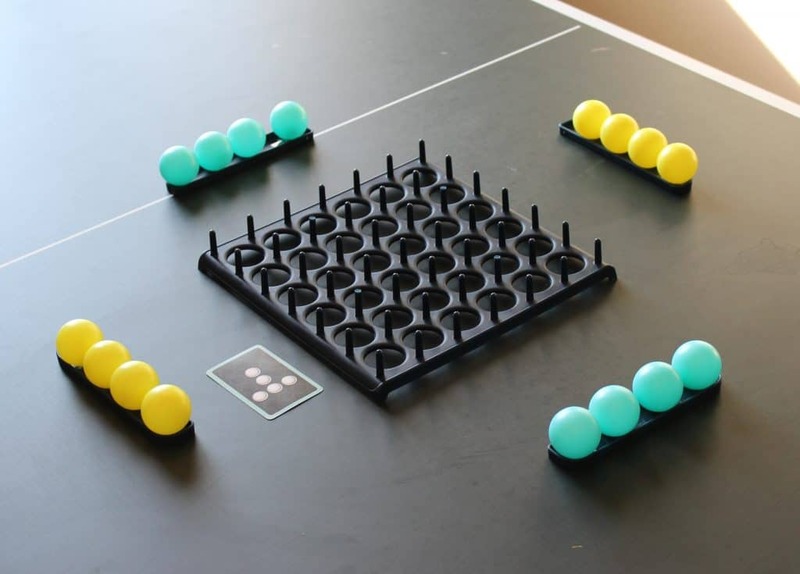 This lesser known game is perfect for family parties with kids and adults of all ages. It’s easy to learn. It’s set up as a board game with player pieces trying to reach the end first. In order to move forward, you need to know and go with the consensus of the group when questions are asked. Players take a turn rolling the dice. When the dice lands on an individual’s name, the question is asked, and then you try to give the answer that most of the other people in the group give. It’s a lot of fun and a great icebreaker for getting to know new guests. Originally released as Snorta, Quack-a-Doodle-Moo is the simplified card version that is a “hoot” with your kids. 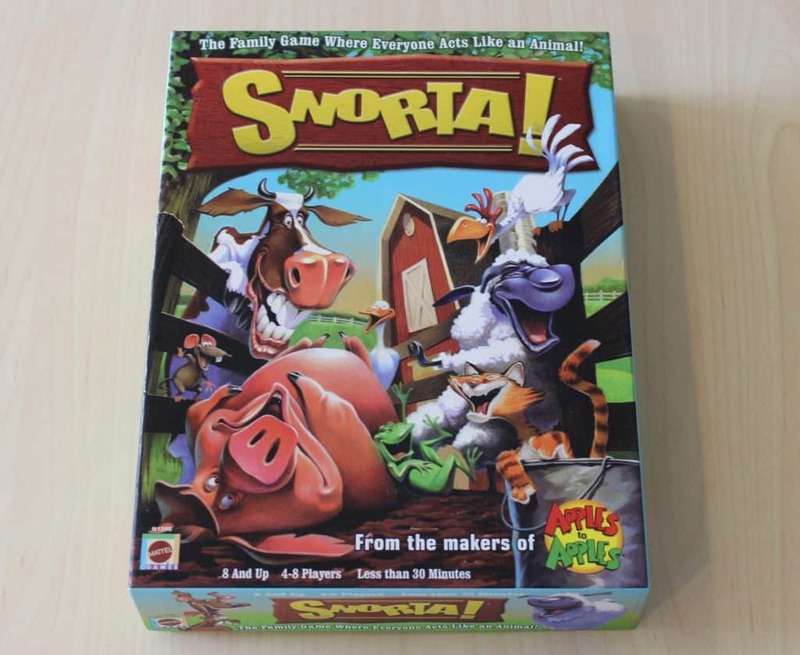 Formerly known as Snorta, this game is one of our favorites as it’s hard enough for adults and easy enough for kids. The game is broken down into rounds where each player assigns themselves an animal sound based on what they draw for the round. When two players have animal cards that match, the players race to say the other player’s animal sound first to gain an advantage. This forces everyone to remember the animal sounds that were drawn in order to win the game. Compared to Snorta, Quack-a-Doodle-Moo has fewer pieces and assigns sounds rather than letting players make up sounds themselves. This is actually a good thing as before we would have arguments as to what actually was a sound that the animal made. Overall, it’s a bit more simple, which is a good thing for kids but a little less fun if only adults are playing. This dice game is easy to play with just about as many people as you want and simple enough to learn that everyone can play. As tables are separated into fours, even my three-year-old is able to play with a little assistance from the others at his table. 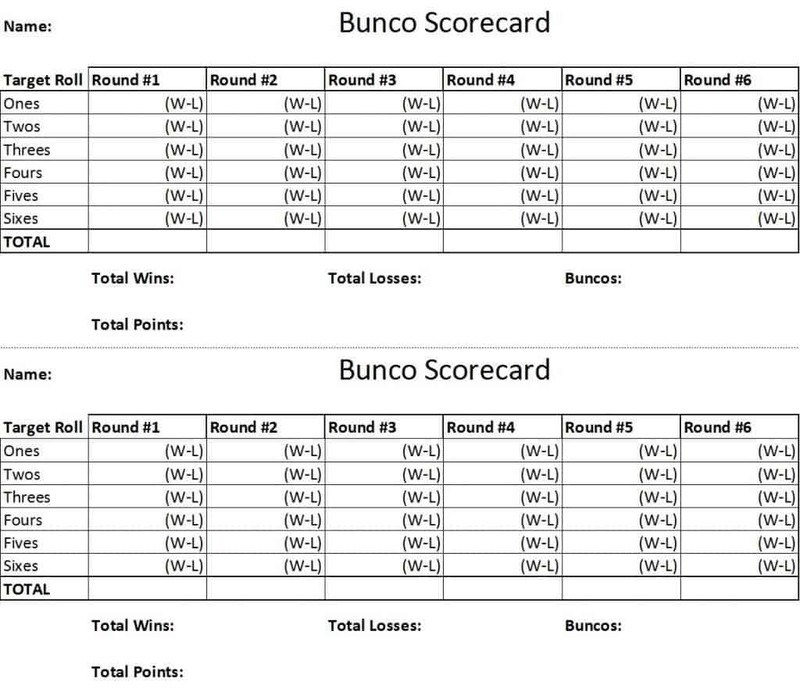 Bunco is an easy-to-learn dice game that’s fun to play at parties with any number of people. 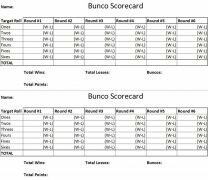 Here are some of the rules that are standard in pretty much any game of Bunco you come across. Generally, there are six rounds with six matches for each round. The four players at each table alternate rolling three dice. Partners sit across from each other at the table. For every match, you’ll rotate who you’re partnered with based upon who won the previous match. A match is won by whichever team scored the most points. In the case of a tie, the dice will continue to be rolled until a team reaches a target roll to break the tie. After a match, winners rotate to the next table while one player from the losing team alternates seats. This is how teams are continually changing. Points are gained as players alternate turns rolling three dice trying to obtain the target number which is the number of the match in a round 1-6. A point is given for every target number obtained for that match, and one player for each team keeps score for each match. If I’m on round three of match two, every team’s target number is two. If I roll one 2, my team gets one point. For two 2’s my team gets two points. For three, I get a Bunco or 21 points. Any time a player rolls and gets points they roll again. If a player does not roll the target roll, they pass the dice to the left. The match ends when someone at the head table reaches 21 points. At the end of the game, the player who won the most matches is the overall winner. At our house, we also play with some additional rules. Three-of-a-kind for any number, other than the target roll, is a baby Bunco, worth five points. 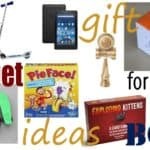 Additional winners are those who receive the most overall points or who have the most Buncos. For tournaments, we often time the matches at three minutes. This seems to take out any of the confusion that often comes with rounds randomly ending. Alternately, we sometimes end a round when any player at any table reaches a score of 21. Three dice for each table. A pen or pencil for each person. A scorecard for each round. Above is a scorecard I made up for the game. Right click to save it as a file to print or you can click on it to open it in a new window and print from there. Want more? Here are some other great games our family likes to play when we get together. Vote for your favorite and don’t forget to leave a comment below! Be sure to take our poll below and leave a comment on which games your family plays in party settings!